Some of us do not know how harmful the average American funeral can be on the environment. The typical burial process can use enormous and unnecessary amounts of materials and chemicals. And, unfortunately, a large portion of these materials end up in the ground. Realizing how detrimental the traditional funeral process can be to our environment has inspired many to look for ways to make their funerals more eco-friendly. A growing trend in the funeral industry is green funerals. These environmentally friendly types of funerals are popular because they reduce carbon emissions, conserve natural resources, and help in preserving and restoring natural habitats. Many green funerals are less expensive because they cut out all those unnecessary and expensive materials and chemicals. Did you know that each and every year traditional American burials fill our ground with 4.3 million gallons of embalming fluids, 20 million feet of wood, 64,500 tons of steel, 17,000 tons of copper and steel, and 1.6 million tons of reinforced concrete? These staggering numbers are the reason why 54% of Americans say that they would be interested in finding ways to make their funerals greener. When wanting to go green with your funeral, the best place to start is with the embalming process. Many people are finding this process unnecessary, especially when you consider how hazardous it is to the environment. The harsh chemicals used in the embalming process do not remain in the body, and once they are flushed from the body, where do you think they will go? Unfortunately, you will be able to find them leaching back into the environment, where they will harm everything they come in contact with. 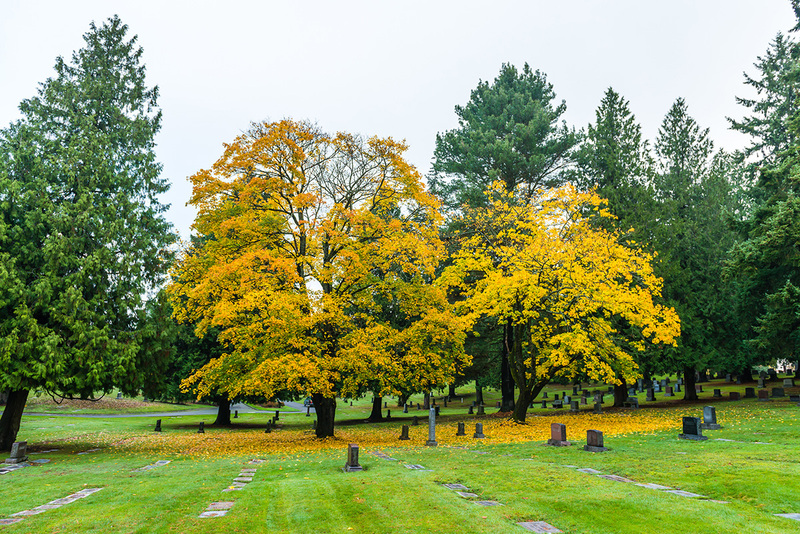 There are ways to embalm a body with dry ice or other nontoxic agents, but the best way to have a green funeral is to skip this unnecessary process altogether. Another factor that has a big impact on our environment is all the materials we use for traditional burials. There are coffins, urns, vaults, monuments, and headstones. There are so many materials used just to place a body in the ground, and many of these materials, unfortunately, come from non sustainable sources. You could opt for many of the sustainable and easily biodegradable coffins on the market to lessen your blow to the environment. However, the greenest option available would be to choose a burial shroud instead of a coffin. These burial shrouds are designed to be easily biodegradable and use a minimal amount of material. Some of us may assume that cremation would be the best environmentally friendly option out there, but we would be wrong. While cremation may save space and materials, it uses a lot of energy and can leave a huge carbon footprint. Unfortunately, there is no perfect solution for having a completely green funeral. Every choice you make will carry its own pros and cons. You will have to pick what is best for you with what happens to be available from the funeral homes in your area, and it will have a lot to do with is available in your area. Hopefully, with the popularity and growth of green funerals more and more options will become available to everyone. However, you should not feel limited to just what your funeral home is selling you. There is a federal that they must accept a coffin provide by you, the customer, at no additional charge. Also, remember that you can also purchase an organic, biodegradable funeral shroud through the funeral home or online. There are ways to get around leaving a huge footprint on the environment when you pass and leaving the environment a little bit better for your kids.